I'm full of happiness to present my own visual data changer. Instant Data Loader - no need to restart LF2 anymore! Media Player for (wav, wma, avi...) - used 'Windows Media Player' AxInterop - cool huh? When you first launch LF2 IDE, you better set 'LF2 Path' setting in the settings window to be able to use LF2 IDE's functionally without any problem. 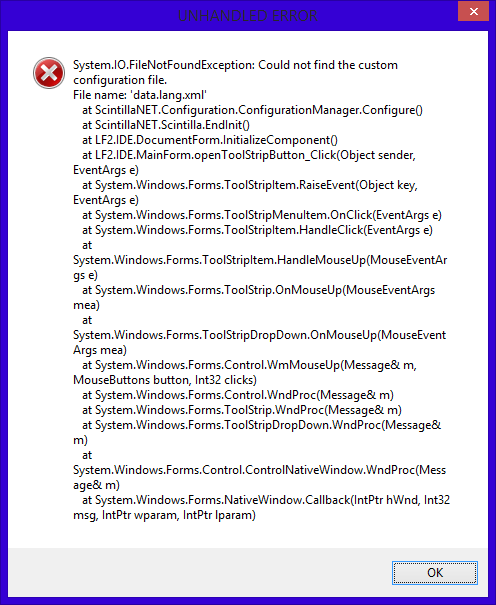 If your 'LF2 Path' setting is set properly, you can use LF2 Debugger, Solution Explorer and Opoint Viewer like a charm. When a data file is opened, it's sprite sheet is automatically loaded so you don't have to do much about it. You can see visual editors empty before any data file is opened, after it is (and have automatically been parsed), you'll see first cell of sprite sheet on visual editors. Click visual boxes to see what's goin on. Changing weaponact property of wpoint generator causes visual boxes to render weapon sprites at (x,y) coordinates and changing cover effects whether weapon will be rendered at the back or front of the main sprite. While editing data, auto comlete list is triggered automatically. When [:], [>] or [Enter] is pressed, selected list item will be inserted automatically. Good luck. Edit: There is an incomplete wiki page if you're interested. Create a library project and add "LF2 IDE.exe" as reference. After you ensure your code compiles successfully, place the *.cs file (not the compiled dll) under 'DataUtils' directory. Code must not exceed one file per plugin. If directory does not exists, create one. You will be able to select this module in the settings window. Good luck. Marti Wong + Starsky Wong - guess why?.. Feel free to post your ideas and bug reports. Yea i remember your DC before, i still have it in my pc. well it wasnt that bad, just not like LF studio. Anyways I saw some improvements in you new ddatachanger. great job. Tools there was really good. i saw a pic number prob: some are not shown correctly! pls stay on topic. whether or not nightmare play chaos faction 2 has nothing to do with this project of his. just tested the IDE, some tags such as mp and hit_Fa etc are shown in black(should be red). and can you somehow make it read where the sprite sheets are from the bmp part of a .dat? since now it require the sprite to be in sprite\sys folder to work... other than that, its quite awesome with all those convenient functions available. WoW! Just WOW! There are some really cool stuff in there! Loved IT! I would usually say "keep it up", but it seems like this community, as an LF2 community, is dying due to LF2 being outdated. But you've done a pretty good job there to deserve the member of the month award. @E.F: I think they are both equally good. This IDE does open faster though, which has always been a problem with the LFS. Tell me if I'm wrong, doesn't LF2 use row and col for each other; I mean aren't sprites have 7 row and 10 col according to meanings of row and column words. I fixed it anyway. @Amadis: of course i did. I really have no idea why ScintillaNet acts like that (it's not my fault). I was about to have a heart attack after reading what you said (I think about sharing source code before I die)... That makes me proud. 2-what is media used for? 3-what is "Args" used for? 1) Pressing enter has no effect: press Unfold/Fold button near comboboxes. Enter now works. 2) Double clicking a known media file (such as wav, wma, avi) in solution explorer will send a 'play' message to media panel. 3) Args work when you open an image file with LF2 IDE. There will be options like: 'Make Transparent', 'Change Pixel Format' and 'Make Mirrored'. Hey! Where is my feedback?.. I'm having a problem loading files to begin with. It says I'm missing data.lang.xml. I assume that's supposed to come with the download? Current time: 04-24-2019, 06:48 AM Powered By MyBB, © 2002-2019 MyBB Group. Theme created by Silverthorn.